Iranians have celebrated Yalda night in Iran since ancient times. Dating back to about 8000 years ago, this festivity, making the longest night of the year, is one of the ancient Iranian traditions. This night is called Shab-e Yalda (Yalda night) and is the time between the last day of fall and the first day of winter. People in ancient times knew that from the first day of winter on, days get longer and nights get shorter gradually. What’s more, they knew darkness as a symbol of evil. So, in fact, they considered the first morning after Yalda the day of victory of the sun and light over darkness and evil powers and celebrated it at this festival. Shab-e Chelleh (the night of forty) is the other name of Yalda night in Iran. It’s called so because it’s the first day of a forty-day period in winter. In terms of Persian traditional calendar, it’s a period of time beginning from December 22nd and ending on January 30th. The last four days of this Chelleh are supposed to be the coldest days of winter. In most parts of Persia, the extended family, relatives and friends gather around and stay up late till dawn, enjoying the night. People were advised to do it because it was believed that evil powers were at their peak at that time, and in this way they would be protected against evil and misfortune. In most of these gatherings, the family and relatives visit grandparents and spend the night with them. A variety of fruits, sweets, and nuts alongside tea and sherbet are served at this occasion. The guests enjoy a fine dinner and after that the elders entertain the others by telling them tales and anecdotes. Reading Shahnameh and divining by Divan of Hafez are the other favorite and common pastimes of this ancient Iranian tradition. Another practice which is prevalent in some areas is what a young engaged man is supposed to do. He sends seven kinds of fruits and a variety of gifts to his fiancée at this night. Sometimes, the girl and her family also try to provide some gifts for the young man in return for the favor. 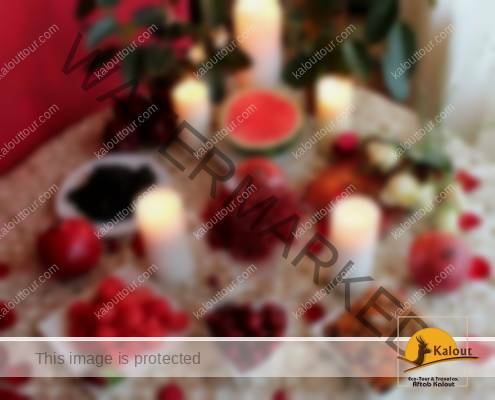 Decorating and lighting the houses and yards with candles were also fascinating customs at Yalda night in Iran. Although it was done before invention of electricity, it’s still common in some areas due to the glamorous view created. Fruits: watermelons, pomegranates, red apples, pears, persimmons, and cooked beets. The first three items are the most important ones. In pre-Islam period, when Mithraism was practiced by Persians, red color was a symbol of the sun due to associating the color of dawn. So, it can be the color of these fruits that makes them the integral parts of this tradition. It’s also believed that eating watermelons at Yalda protects individuals from the excessive heat or any disease caused by the hot weather of summer. Ajil: a combination of nuts most commonly such as pistachios, almonds, hazelnuts, in addition to raisins, dried apricots or other fruits, figs, and roasted seeds of watermelon and pumpkin. The nuts can be roasted or raw to be mixed. Beverages: usually tea and a variety of sherbets. And if there is snow, a mixture of snow and grape extract can be refreshing and memorable eating experience for you at Yalda night in Iran. The main meal for dinner: rice and fish if possible, otherwise, one of the local foods depending on each city or region. Celebrating the beginning of winter is not something happening just in Iran. There are some other areas like Pakistan, Japan, China, Korea, Philippine, Thailand, Vietnam, Scotland, Bolivia, Peru, Ecuador, Bahamas, Jamaica, Carolina and Virginia, Russia, etc. which hold such a ceremony. All of them welcome winter and celebrate this night according to their own traditions.